If you are looking for Paul Hobbs, you will most likely find him in a vineyard. Growing up on a working farm in upstate New York, Paul experienced first-hand the influence of terroir on the character of fruit, when his father had him taste apples of the same variety grown in different orchards several miles apart from one another. The diversity of flavors and textures made an impression on him and would later influence his approach to winemaking. As a winemaker, Paul is highly regarded for his ability to identify exceptional vineyards, and for his pioneering spirit in working innovatively with new and historical sites and regions. His success has inspired a wealth of nicknames among the press, from quiet trendsetter to prospector to truffle-hunting dog. 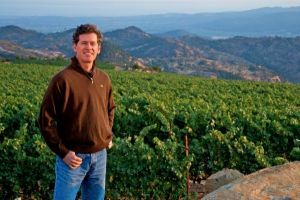 Hired by Robert Mondavi for his advanced understanding of oak aging, he went on to become winemaker for Opus One and Simi wineries, and then consultant to Peter Michael, Fisher, Lewis, Catena and others. He founded Paul Hobbs Winery in 1991. Paul knows that the essence of profound wines can be traced back to meticulous care and expertise in the vineyard. Meticulous vineyard management followed by minimally‐invasive winemaking techniques is his approach to producing wines that express their vineyard origins with utmost finesse, complexity, and authenticity; in other words, wines with a sense of place. Fermented with native yeasts and aged in French oak, all are bottled unfined and unfiltered.